In short I am resampling the new returns each time, so I am obtaining a single new series with each iteration. I am wondering which of the approaches is a correct method of parametric bootstrap. I am not including any details on the models and test statistics to keep the post simple, as only the method of obtaining the new return series is important here. edit: To give some more info. The whole process simplified looks like this: I have a series of returns, I estimate a GARCH model, create two asset allocation strategies in-sample, calculate a statistic that shows which strategy is better. And now I want to know if the result is statistically significant. 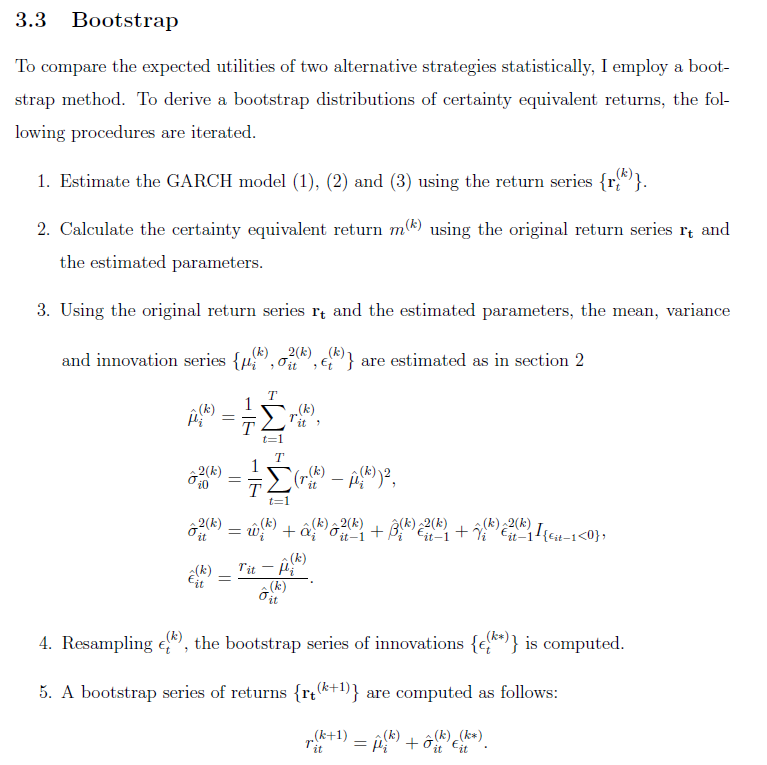 To do so I want to do a parametric bootstrap using the estimated GARCH model. I take the $\mu$ from the model and add resampled standardized residuals to it to obtain $n$ new series of returns. On each of the bootstrapped series I once again estimate the GARCH model, once again solve the asset allocation problem (and obtain different weights for the asset than in the initial run), calculate the statistic and from all $n$ statistics I calculate the final p-value to see, whether the result is statistically significant. Just a follow-up question to be sure: after having solved the initial asset allocation problem and obtained the weights I do the bootstrap to obtain $n$ new series of returns. Do I apply the same weights to those series and see if one asset allocation strategy outperforms the other or do I solve the problem for each bootstrapped series from scratch, thus obtaining different set of weights each time? edit2: I have found a paper that is doing a similar thing to my research, however, it uses a strange bootstrap method, as in some steps it uses the original returns and in some the bootstrapped ones. Equation (1)-(3) mentioned in the fragment are those of a GJR-GARCH model. Is this iterative approach, somehow similar to the one I described as point 1. correct, with taking the original returns in some steps and the new bootstrapped series in other steps? 3) take the sample mean of these quantities. Not the answer you're looking for? Browse other questions tagged portfolio-management returns simulations bootstrapping bootstrap or ask your own question.